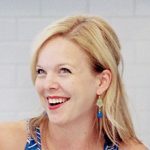 This time of year can be a weird time of year for me food-wise. We’re definitely well past the time for heavy comfort foods, but much of the “traditional” cookout style fare such as burgers, hot dogs, etc. doesn’t appeal to me either. I need fresh, interesting, (mostly) healthy and still satisfying. Finding meals to fit all of these requirements is certainly no easy task and to be perfectly honest, has left me feeling very uninspired lately. Thankfully inspiration struck and hit this one out of the park over the weekend. 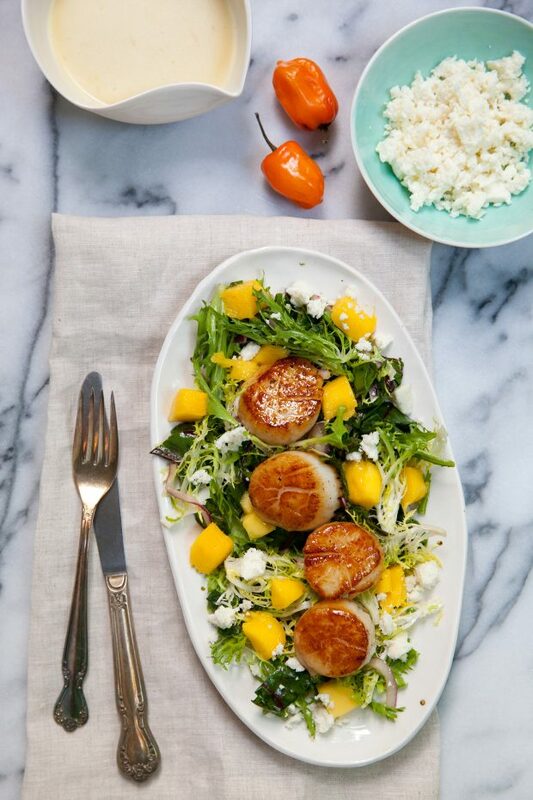 This salad consists of massaged sturdy greens (kale or chard) and frisée tossed with a habanero garlic citrus dressing, mango, red onion, queso fresco, and seared scallops on top. It is healthy, fresh, satisfying and most certainly not boring. The dressing definitely has some heat to it, so be mindful of that when adding it to the greens. I have a medium-high spice tolerance and I loved this dressing. It has a nice kick without obscuring all of the other flavors in the dish. This is definitely simple enough to be suitable for a weeknight but simultaneously impressive enough to be equally welcome on the table while entertaining guests. 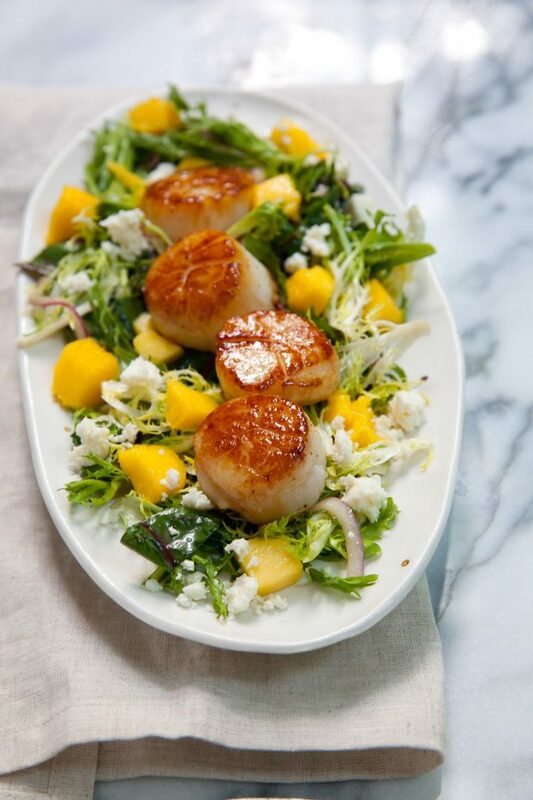 It will certainly be a go-to option for me whenever I come across good quality fresh scallops. In a medium-large salad bowl, massage the kale or chard until somewhat softened and a deeper green. Add in the frisée and the red onion, as well as about 3 tablespoons of the dressing. Toss well to coat. Divide the salad among serving plates. Top each serving with a generous sprinkling of mango and quest fresco. Pat the scallops dry and season well with salt and pepper. Heat a large skillet over medium-high heat and add the clarified butter, swirling to coat the pan. Add the sugar to a shallow dish and working quickly, coat one side of each scallop in sugar, grasping the sides and using a gentle twisting motion to help the sugar adhere. 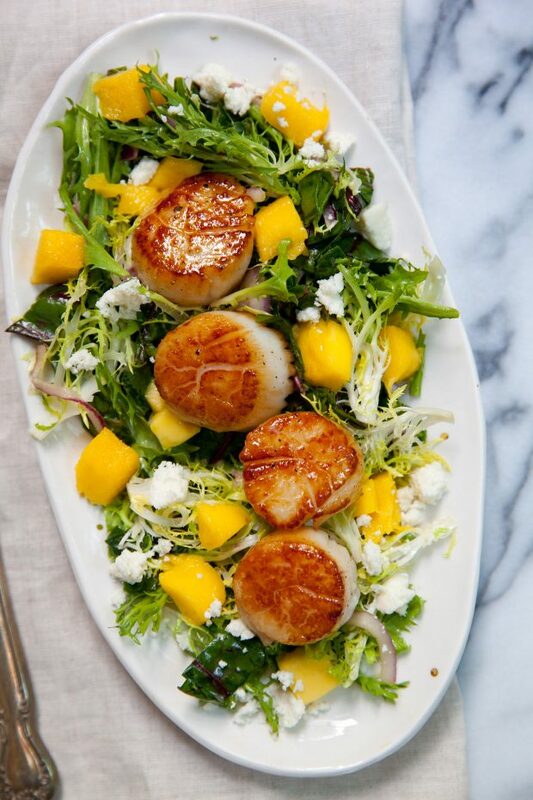 Place the scallops sugar side down in the skillet and sauté for 2½ minutes. If the sugar starts to brown too quickly, reduce the heat. Flip the scallops over and cook for 1 minute more. Remove from the heat and add to the plated salads. Serve immediately.